Sculpture of Chen Yuanguang, who along with his soldiers settled the area that would one day become Fujian province. The memorial is in Yuanguang Square of Gushi county, Henan province. With a strong sense of ancestral identity, Chinese at home or from abroad are willing to take epic journeys to visit their family homelands. 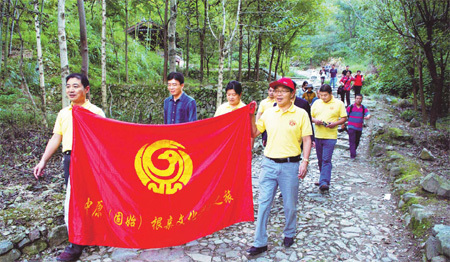 Early this month, 20 residents of Gushi county in Xinyang, Henan, embarked on a road of discovery in a reverse direction. They journeyed not to find where their ancestors came from - but where they went. They started from the Chen Yuanguang ancestral temple in Gushi's Chenji township and traveled more than 2,000 kilometers to the southeastern coastal province of Fujian. The trip led them from the central plains to the semitropical south find those with close blood ties to far-distant Gushi. Chen Xuewen, a genealogy researcher from Gushi and member of the delegation, told China Daily that the shared ancestry can be traced backed to the early Tang Dynasty (618-907). More than a thousand years ago Gushi native Chen Yuanguang, together with his father and sons, commanded an army in then-remote Fujian as part of an effort to establish a regional administration. During the endless wars of the late Tang Dynasty, Wang Shenzhi - another Gushi native - together with his two brothers also led an army to the province. Wang later became the King of Min, or King of Fujian. Both Chen and Wang's families and soldiers - mostly from Gushi - settled in Fujian. Their descendants now number in the tens of millions. They brought with them advanced culture and farming techniques, which had a far-reaching impact on the development of Fujian. As a result, Chen Yuanguang and Wang Shenzhi are regarded as the founders of Fujian. Following in their steps, the 20-person team from Gushi visited descendants in Fujian and other provinces traversed by the expedition. As the starting point, the Chen Yuanguang Ancestral Temple in Chenji was newly refurbished before Oct 1. Chen's statue stands in the center of the main hall to receive admirers. An inscribed board above the hall and couplets on both sides praise his great deeds in developing Fujian. Inside the temple, Lin Zhongyuan, a Gushi government official, gave maps to members of the sojourn before they left. The map showed the journey through five provinces, 10 counties and many cities across nearly 3,000 kilometers. "This is not only a trip to cherish the memory of our common ancestors, but also a journey of care about Gushi descendents," Lin said. The group's first stop was the Fifth Ancestor Temple in Huangmei county of neighboring Hubei province. The temple has a special significance in Chinese Buddhist history because it was home to Hongren, the fifth ancestor of the Zen sect. Genealogy researcher Chen said the central province Henan suffered such unrest in the late Tang Dynasty that Wang Shenzhi's army retreated to Huangmei, a juncture of Hubei, Henan and Jiangxi provinces. Faced with the surging Yangtze River in front and pursuing rebel troops in back, Wang, a Buddhist, decided to go to the temple for advice. Records recount how Wang drew lots - sacred sticks that monks used to foretell the future - that suggested he would be a king if his army crossed the Yangtze and continued all the way south. 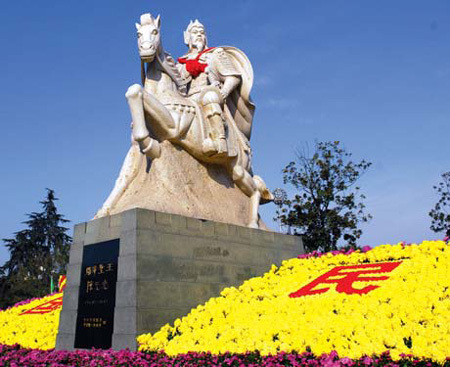 Wang did become the king of Fujian. He remained a devout Buddhist and built or repaired more than 200 temples in the province. It was a difficult trek for Wang, but it was even harder for Chen Yuanguang's expedition. In 669, Chen's troops set out from Gushi along the Beijing-Hangzhou Grand Canal. They decided to enter Fujian through Pucheng county and along the Minjiang River. The ancient route over Xianxia Pass in Zhejiang province was the only way to Pucheng. It was a difficult march. According to historical records, Chen's two uncles - Chen Min and Chen Fu - died on the pass from sickness. The modern Gushi team arrived at Xianxia on Oct 4. "All of us sincerely admire the courage and enterprising spirit of our ancestors," said Li Junjie, deputy head of Gushi county government and leader of the group. Li said the ancient Xianxia pathway is a significant link through which ancestors created prosperity in Fujian. The delegation found many imprints of Gushi when they entered Fujian. Pucheng is their first stop in the province. Qiu Wenbin, director of the local chronicles committee, led the group to a cemetery outside the county seat. According to local annals, in 670, after Chen Min and Chen Fu died in Xianxia, their sons Chen Yuanjing and Chen Yuanyang then died along with hundreds of soldiers from illness when they entered Pucheng. The northern troops were not adapted to the humid forest of the south. "Let's bow together for them," genealogy researcher Chen Xuewen said. As he read a memorial address, the group expressed their respect to the forebears from Gushi. Chen Yuanguang's clan left no descendants in Pucheng, but a host of soldiers from Wang Shenzhi's detachment settled in the region. "Our ancestors were then responsible for logistics in Wang's troops," Qiu Wenbin said. "There are very detailed records in our genealogy that we are the descendants of Gushi people." 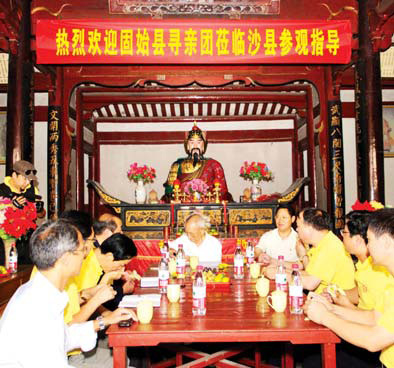 On Oct 5, the group arrived at Shaxian, a county renowned for Fujian snacks, and was welcomed by Deng Zhaosheng, deputy head of the county government. Deng said he is a descendant of Deng Guangbu, who was also a member of Wang's army. Deng Guangbu's descendants now number more than 160,000 spread across 35 counties in Fujian and neighboring provinces. The Huang temple in Minqing county is the largest ancestral citang in Fujian. Ancestral temples - or citang in Chinese - each have unique characteristics, with family clans building its own citang as a public place for worshipping ancestors and discussing and deciding great clan issues. The Huang Six-Branch Citang was built to honor Huang Dun, a member of Wang's army from Gushi. Huang had six sons and their descendants can be found across Fujian, Taiwan and Southeast Asia - totaling nearly 3 million progeny. After entering Fujian, the Gushi delegates received warm reception that included welcoming firecrackers. On Oct 5, Shaxian resident Cao Zhenjian, 82, enthusiastically shook hands with everyone. "I was so happy that I could not sleep for days after I heard that you would come to find relatives here," he said. The group arrived at Cao Peng Ancestral Temple, built to commemorate the Gushi son who became the first head of the Shaxian county government in the Tang Dynasty and is still venerated as "the first ancestor of the county". Cao Zhenjian pointed out a map of Gushi in the temple. "One of Cao's relatives gave me this map and I hung it here to tell the families that we should not forget our roots in Gushi," he said. In the morning of Oct 8, hundreds of people waited at the foot of Lotus Mountain in the suburbs of Fuzhou, capital of Fujian province. Wang Tie, Party chief of Xinyang, and Fang Bo, Party chief of Gushi, led the delegation to visit the tomb of Wang Shenzhi. Honoring the tomb of Wang Shenzhi in Fuzhou city. Born in Gushi county, he founded the Min Kingdom in the area known today as Fujian province. Gushi residents talk with local residents in the Deng Guangbu Ancestral Temple in Shaxian, Fujian province.